The fabulous Siberian taiga – the glittering snow piled high in banks, the pure air, the smell of silver fir under the stars – is not a myth. Although one of the biggest wooded areas known to man is indeed wild and difficult to reach, it is still possible to visit with some planning. “What is a man’s life like in the taiga? He is replete and content. And so were the Evenks in the taiga, too. They went from river to river and from mountain to mountain hunting the squirrel.” This is how an Evenk fairytale recorded by researchers in Siberia in 1931 begins. If the taiga is an immense and abstract symbol of Siberia for much of the world, then for Siberians themselves it is both the forest and home. Ever since ancient times the native peoples have taken possession of its impenetrable spaces. In summer they would cross it on foot, riding horses or reindeer, while in the winter they would go hunting and wear special climbing skis with reindeer or elk skins attached to improve their grip and traction when climbing. Despite the fact that many Siberians today live in cities and no longer hunt for food, a ski trip through the taiga still remains a popular pastime for peoples indigenous to the area, as well as Russians. Indeed, visiting the taiga can be a liberating experience. 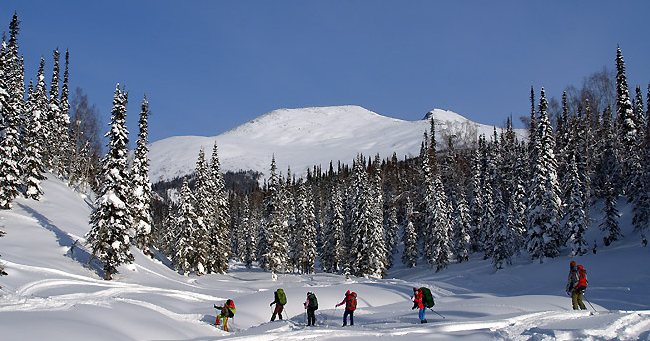 We have outlined a trip that will ease your fears of fleeing civilization in winter for the mysterious taiga. The taiga is one of the largest surviving woodlands in the world. The World Wildlife Fund (WWF) has included it on its Global 200 list, which includes forests deemed to be the most important for the preservation of the ecosystem. It is not easy for average city dwellers to venture into the authentic, thick Siberian taiga on their own. By contrast, it is quite easy to get lost and freeze. That’s why we recommend going with “Sibirskie ekspeditsii” (Siberian Expeditions) from Novosibirsk and their team of professional guides and instructors. Every year Sibirskie ekspeditsii organizes ski trips to the “Podnebesnye zubya” (celestial teeth), an area popular with tourists in the Kuznetsky Alatau Mountains in Kemerovo Region. This area is unique with its untouched taiga and mountains. But there is also decent touristic infrastructure here such as hut shelters dating back to Soviet times, in which visitors can spend the night without having to forsake warmth or comfort. A winter trip through the Siberian taiga provides an excellent overview of the landscapes for ordinary city-dwellers. Those that love nature and active leisure pursuits will enjoy the daily ski marches from one cabin to the next, meals cooked on an open fire, descents down hills and a steam in a Russian “banya.” The organizers link the excursions to lunar phases, so visitors can expect to witness the spectacle of the full moon as seen from the mountains. Guests to the taiga often remember breathing the pure, chilly air, admiring the snow-covered “paws” of fir trees, cedars, silver firs, and looking out at the stars at night while sipping herbal tea. In winter, tourists often come to Kemerovo Region (a particularly popular destination is Sheregesh: from large Siberian cities, as well as Moscow and St. Petersburg.